And then we suddenly find ourselves in the real world, only to realize that numbers actually do play a pivotal role in what we do — especially in digital marketing. The trouble is, many marketers are right-brained, meaning Excel spreadsheets riddled with numbers and formulas aren’t all that inviting. Making them from scratch can be especially intimidating. While we won’t argue with that, we will say that the advantages of leveraging Excel’s functionality to organize information and streamline tasks are unparalleled. To help those of you looking for a way to sharpen your skills, we’ve put together a detailed list of ways you can start using Excel to simplify your marketing tasks. Complete with templates, these suggestions will have you making strides in no time. Know what’s even better? You can download this full collection of Excel templates in one fell swoop. While marketing budgets vary from business to business, the need for structure and a clear sense of alignment between your goals and your spending is critical across the board. To ensure you’re always prepared for unanticipated costs, it’s important that you’re not only allocating your budget thoughtfully and properly, but that you’re also keeping tabs on how closely you’re sticking to your projected expenses. If you want to avoid a mess at the end of the month or quarter, take a look at this collection of 8 marketing budget templates, designed to help you organize your marketing spend better. From product marketing, to website redesign, to content marketing, to events, these templates serve as a guide for marketers to visualize and track their expenses to avoid overspending. The collection also contains a master marketing budget template that’ll help you generate a high-level visualization of your marketing budget on both a month-by-month and quarterly basis. Download the marketing budget templates here. You might already use a social media scheduler to manage and publish your posts every week, but you still need a place to draft your social copy and decide which posts will go to which social networks. And because most social media schedulers allow you to upload social post copy in bulk, from a spreadsheet, it behooves you to have an Excel template designed for this purpose. With that in mind, we created the Excel template shown above. This social media posting schedule allows you to draft each social post, the date/time it is to be posted, the message you want to publish, and any link you want to accompany your message (that link could be a blog post, registration page, an ebook landing page, you name it). Once you’ve drafted all of your social posts for the week, month, or quarter, you can sort them by social network and upload your Excel file into your social media platform of choice. Download the social media posting schedule here. Blogging plays a significant role in your ability to attract visitors and leads to your website. But managing a blog is one of those responsibilities that’s easier said than done. Whether you’re struggling with ideation, consistency, or simply just lacking organization, an editorial calendar can often serve as the solution you need to refocus your blogging efforts and generate even more traffic and leads from your content. Visualize the blog posts you plan to publish in a given week or month makes it easier to define overarching themes, keep track of ideas, manage contributions, and prioritize strategic distribution. Use this editorial calendar template as the starting point for keeping track of all of your business’ content. It’ll help you be more mindful of topic selection, buyer personas, keyword inclusions, and CTA alignment. Download the blogging editorial calendar template here. Whether you’re planning for a new year, quarter, or month, defining a clear set of goals is critical for driving the direction of your marketing efforts and priorities. Do you need help not only setting marketing objectives, but actually achieving them? 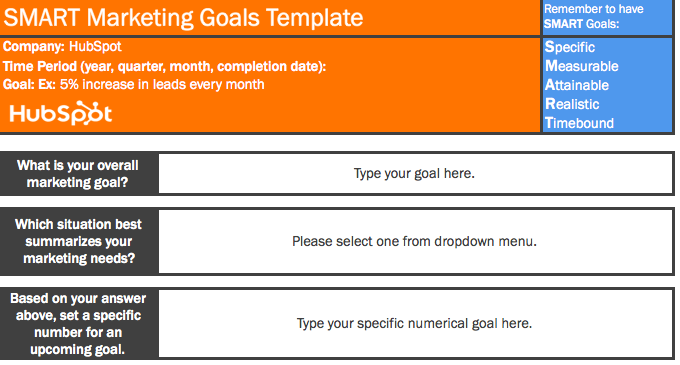 Start with these SMART goal planning templates. Rooted in specificity, measurability, attainability, relevancy, and timeliness, these templates will help you set your team up for success while providing you with a tool for identifying your greatest marketing needs. Download the SMART goal planning templates here. When it comes to SEO, there’s a lot for marketers to remember in order to see results. (Put another way, there’s a lot for marketers to forget.) With search engines evolving and algorithm changes turning your existing strategy on its head from time to time, it can be easy to feel overwhelmed and push off revamping your SEO strategy. However, SEO should never be treated like an afterthought. If you’re looking for the light at the end of the tunnel, pull up this handy SEO template created in Excel. Designed to make the process of managing your SEO efforts a whole lot easier, marketers can use this template to guide their strategy step-by-step or pass it off to their webmaster to serve as a helpful guide. It focuses on not keywords and SEO best practices while providing tips and tricks to identify nuances and increase productivity. Download the on-page SEO template here. If you’re doing your Google Ads campaigns right, they probably aren’t exactly walks in the park. That’s because to get the most bang for your buck, you’ve set up multiple campaigns with multiple ad groups and have variations of your campaigns — all with different content. Not only that, you’re (hopefully) also keeping track of those campaigns to determine which ones to shut off, add more money to, or tweak. Sounds like a lot to keep track of, right? But take a deep breath. This Google Ads tracking template can keep you on top of your Google Ads game. It’ll help you catch mistakes and implement best practices across all the different campaigns and ad groups you’re running — for the top, middle, and bottom of the funnel. Not to mention, it’s a perfect complement to that SEO template you’ve started using. Download the Google Ads tracking template here. Since you’re probably generating tons of clicks from your Google Ads campaigns and writing awesome content thanks to your blogging editorial calendar, you’re going to need some help figuring out how to spread the love on social. We’ve got just the thing. 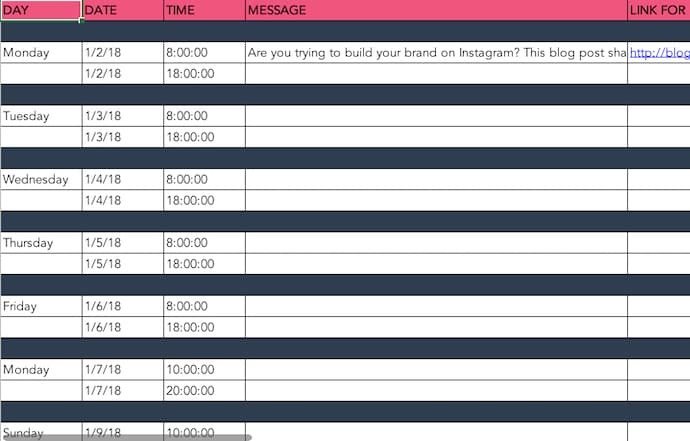 The social media calendar template is the perfect resource for helping you scale and streamline your social media marketing. When you use Excel to break out separate worksheets for each social network you’re using, you’ll be able to keep a repository of content ideas so you’re never struck by writer’s block, and always have something to post. It’s also worth mentioning that Excel really comes in handy when it comes to Twitter, as it has the ability to count your characters to help you write tweets that stay within the 140 character limit. Download the social media content calendar template here. It’s no secret that sales and marketing are known to have a pretty rocky relationship history. Sales might think marketing isn’t generating enough leads, while marketing might think their sales reps aren’t capitalizing on the leads they’re sending over. When it comes down to it, though, finger-pointing doesn’t grow a business. In an effort to better align your sales and marketing teams, turn to this template for creating a service-level agreement (SLA). Generally speaking, an SLA is a contract that defines the expectations sales has for marketing leads (both quantity and quality), as well as the expectations that marketing has for how sales will act on qualified leads. With this customizable SLA template in your toolbox, you’ll have the information you need to reduce tension, define a concrete monthly lead generation goal, track and measure the success of specific lead generation channels, and keep close tabs on your current sales close rates. Download the service-level agreement (SLA) template here. You have to set a leads goal, but you don’t know where to start. Then, once you finally figure that out, you have to determine how much traffic you need to hit that goal … but you’re not sure what approach to take there, either. Sounds like you could use hand calculating your leads and traffic goals. Luckily, there’s an Excel template for that. Rather than try to sort of these numbers on your own, this template is designed to take care of the math and leave you with a clear picture of what you need to accomplish in order to achieve your traffic and leads goals and ensure the health of your inbound marketing strategy. Download the leads and traffic goal calculator here. To simplify your reporting, check out these monthly marketing metrics templates (and the corresponding PowerPoint template). Each, month, you can update them quickly and easily to reflect your monthly visits, leads, customers, and conversion rates. From there, you’ll have everything you need to accurately track and report on which channels are performing best. Every boss loves to see ROI, so you can’t go wrong with these templates. Download the monthly marketing metrics templates here. How do you use Excel to streamline your marketing? Share your favorite techniques, tips, and templates in the comment section below. If you’re a fan of the monthly metrics template — item #10 on this list — you might want to grab a copy of this template as well. The essential KPI tracker, shown above, takes the metrics your marketing team has agreed to track and describes them in more detail. KPI stands for “key performance indicator” — they’re basically your most important metrics, each with a unique purpose and place in your marketing strategy. Using this template, you can assign specific employees to each KPI, define the frequency at which you’ll monitor each KPI’s performance, and assign each KPI a color that reflects the quality of that KPI’s performance. If one of your KPIs is organic traffic, for example, you can set up your template such that 100 page views per month is red (poor performance), 500 page views/month is yellow (stable performance), and 1000 page views/month is green (great performance). Download the essential KPI tracker here. Want more Excel tips? Check out these Excel formulas, keyboard shortcuts, and tips.